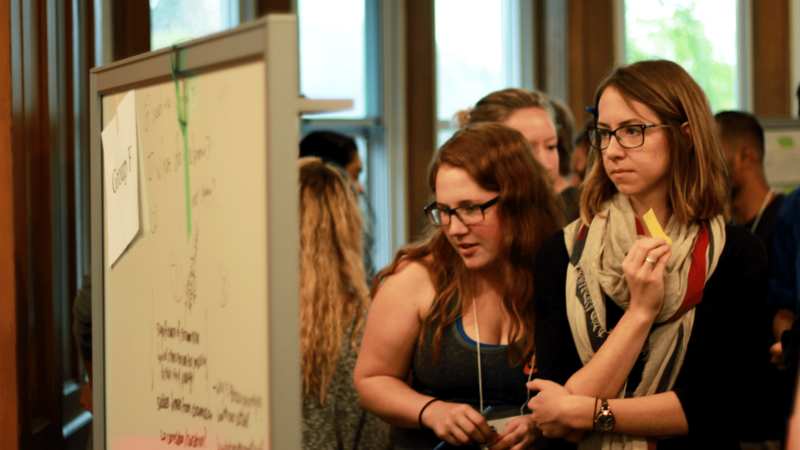 University of Guelph students cooked up some unique ideas this year in the Ideas Congress course. The class, a partnership with the Feeding 9 Billion program, gave students the opportunity to test unique ideas to manage food issues. For some, that meant baking with bugs and ingesting some insects. Class groups each picked an issue to tackle this semester, through a scalable solution that could bring about social change. Both the “Bug Bitez” and “Insect Effect” teams spent the semester determining how to make a difference to food security issues through alternative protein promotion and products. They hope that if consumers know delicious insect products are an option, they’ll choose them over more resource intensive animal proteins, such as beef. Insect Effect developed a campaign to educate the university and the community on the benefits of an insect-based diet (called entomophagy) and reduce the stigma surrounding insect consumption. They plan to work with professors to make entomophagy a point of discussion in more classes on campus. Bug Bitez plans to create a pasta sauce that looks and tastes exactly like Spaghetti Bolognese, but instead of ground beef they’ll be using cricket protein. “We are hopeful that this familiar, convenient comfort food can help to change Canadians’ minds about edible insects,” says Kelsey Flannigan, a member of Bug Bitez. Both groups are aware of the “ick” factor North Americans tend to have when it comes to the idea of putting bugs on their plates. Part of their strategy to combat consumer fear is through awareness that globally, insects are already a regular part of many people’s diets. Throughout the semester, the teams had some unique revelations. Different cricket breeds have different tastes, so consistent supply needs to be considered. And while crickets may require fewer resources from birth to harvest, there are few suppliers making the price for cricket protein steep. Each group in the class has been conducting research on the market and surveying their target audiences to understand their needs and habits, throughout the semester. For their final presentations last week, the students pitched their concepts, highlighting how they had evolved their ideas with teacher, peer and advisor feedback. Many of the groups connected with external partners to better understand the problem, and also submitted their ideas to funding opportunities in the community and nationally. Many groups plan to follow their projects through outside the classroom. For Bug Bitez, they see it taking several years to develop a prototype and bring it to market, but hope to work with local business incubators to make their plans a reality. Insect Effect plans to continue work on community outreach, including creating an educational display for College Royal in March.